Thanks for visiting North Dakota butterflies. For a Northern state, North Dakota hosts a fairly diverse population of about one hundred and fifty species. The season tends to be a bit more condensed with less early and late season butterfly populations, so residents interested in maintaining butterfly gardens need to take that climate fact into account during their planning. Even a simple choice of an ash, poplar, willow, birch or wild cherry tree in the back yard is sufficient to attract Canadian Tiger Swallowtails. Their caterpillars consume the leaves. Viceroy butterflies, pictured above, also use willow trees as their larval host trees. In addition to butterfly gardens, North Dakota butterfly identification adds to the typical outdoor adventure. Butterfly identification anywhere usually begins with color. This introductory page divides North Dakota butterflies according to families, which unsurprisingly almost equals wing color. additional butterfly pictures and identification help can press the green butterfly button. There’s a nice balance of whites and yellows in the state. 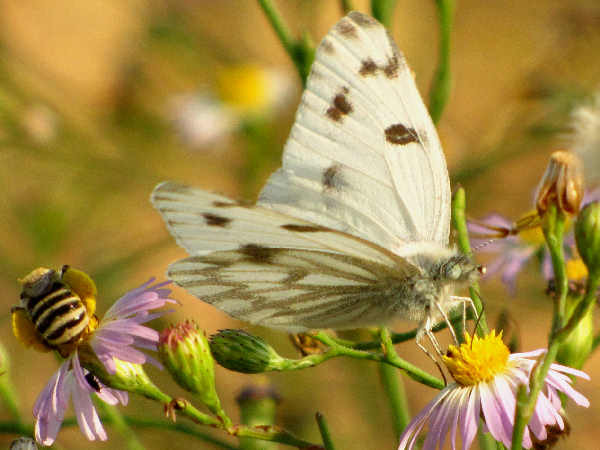 The Checkered White is a native species that often uses weedy plants as caterpillar hosts. It might be confused with the Western White. The yellow butterflies often dominate North Dakota fields because the caterpillars eat alfalfa and clover fields. 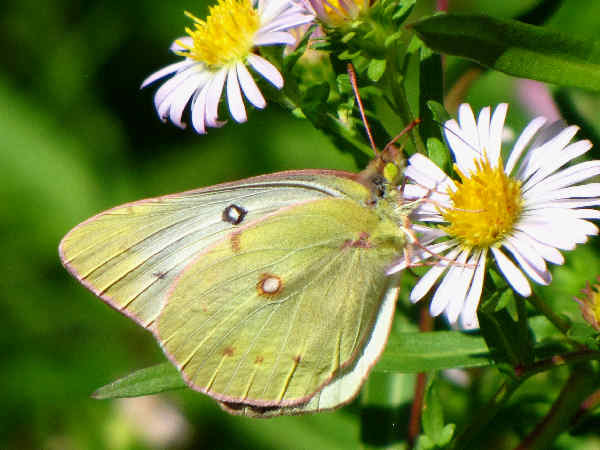 Some residential areas with clover could see the presence of yellow butterfly species, otherwise, they are not usually considered the basic butterfly for a butterfly garden. The large number of yellow butterfly species need to be tempered with the realization that most are stray or occasional visitors. Clouded sulphurs and Orange Sulphurs are the most common species. They have a state side presence. Finding additional yellow butterflies during the season is always exciting. For a Northern tier state, North Dakota hosts a very nice variety of blues, coppers and hairstreaks. 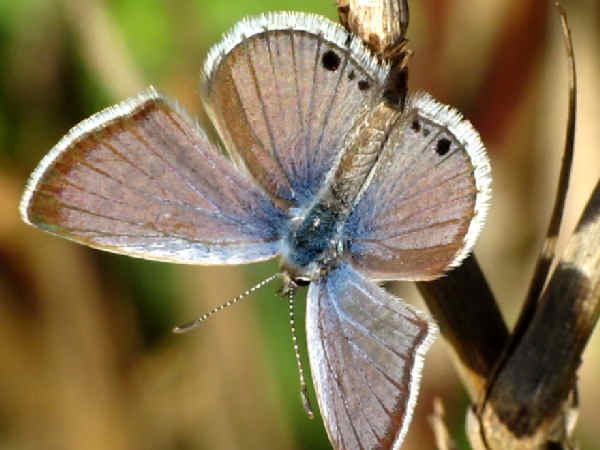 Western Tailed-blues and Azures are probably the most wide spread of the species. The picture shows a Reakird’s Blue. 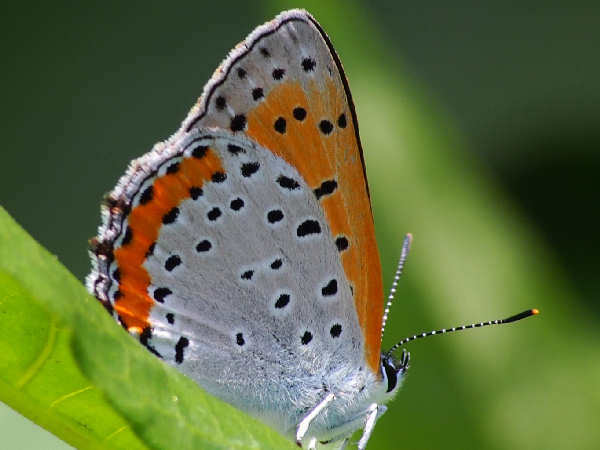 Not shows is the side view with a more prominent pattern and a darker background color compared to the Tailed-Blues and the Azures. The top view of the male is decidedly blue in color. About one-half of the state’s hairstreak butterflies, like the pictured Coral Hairstreak, have a state wide range. That fact translates into multiple hairstreak butterfly sightings for the butterfly watching crowd. 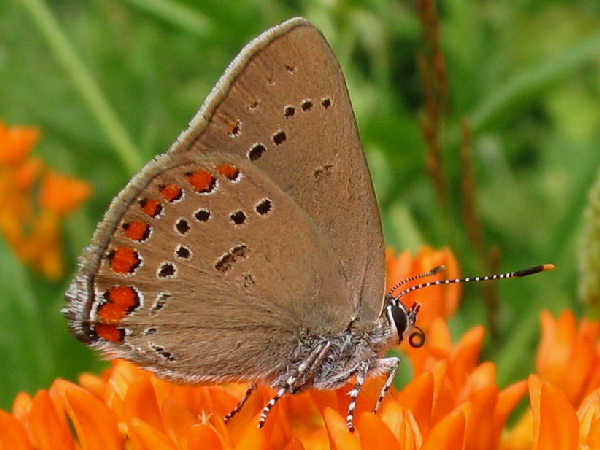 Gray Coppers and Bronze coppers are North Dakota’s most common copper butterfly species. The picture shows a Bronze Copper. The wide diversity of North Dakota brushfoots can be attirbuted to habitat diversity. 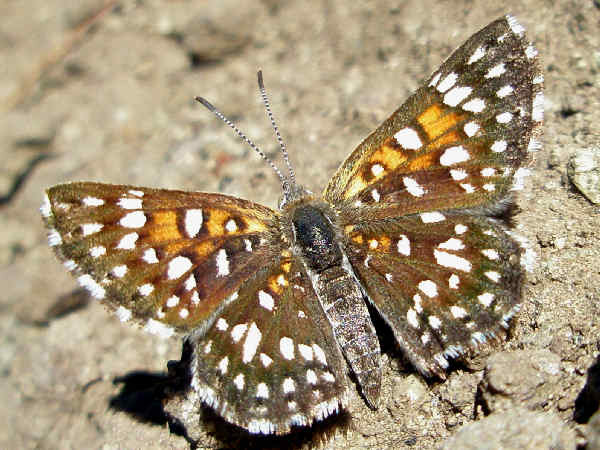 Many of the checkerspots, commas, ladys and admirals can be found in gardens and residential areas. Residents interested in planning a Monarch Butterfly garden should note that two milkweed species, the Showy Milkweed and Whorled Milkweed are native to all of North Dakota and would serve as great plants for Monarch caterpillars. 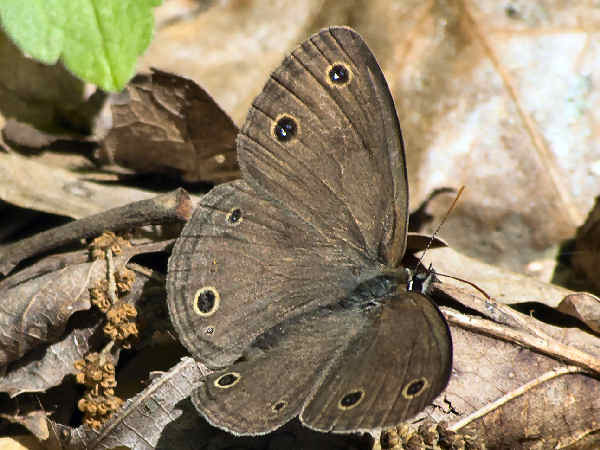 The Little Wood Satyr, pictured, lives around woodland edges and glades. Smaller tha the Common Wood Nymph, they tend to be early season butterflies. 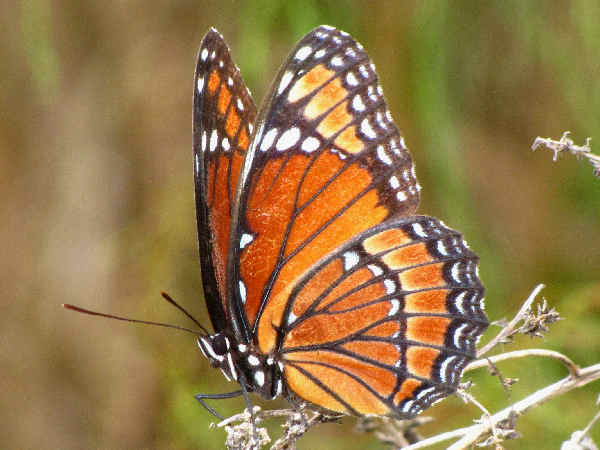 It has two conspicuous eyespots on the outer forewings, and it has a fairly wide distribution in the state. Canadian Tiger Swallowtails are the most common of the Swallowtail species. On the other hand, Giant Swallowtails are not very common in North Dakota. Finding one is a great pleasure for butterfly enthusiasts of the state. Be alert. It might be difficult to initially differentiate the Giant Swallowtail from other North Dakota swallowtail butterflies with dark wings. 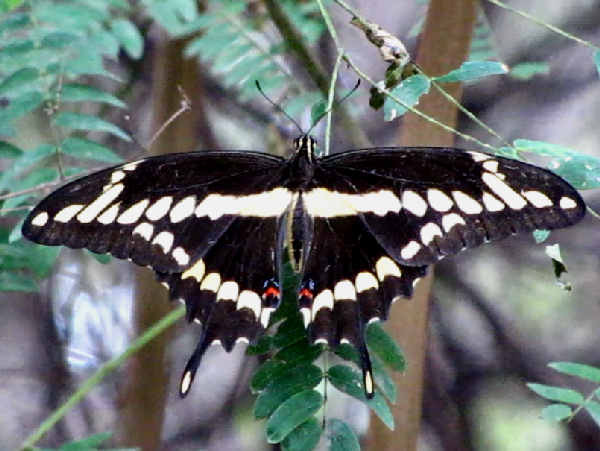 Black Swallowtails, for example, are fairly common in the western half of the state. The easiest way to identify Giant Swallowtails is to look at the underside of the wings. Giant Swallowtails have yellowish colors.